Picture Arrowwords - Fun for puzzlers of all ages! 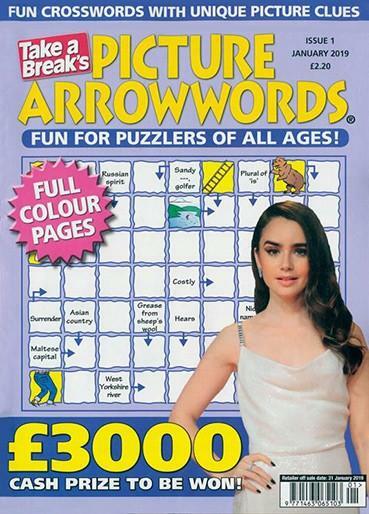 Every issue is packed full of colourful arrowwords and there are also £3000 cash prizes to be won too! Picture Arrowwords is just like regular arrowwords except many of the clues are pictures to brighten up the solving puzzle experience! You'll also find puzzles such as Say What You See and Picture Code - which feature some words of wisdom from a celebrity face. Take a Break's Picture Arrowwords magazine is available in print format so you have your magazine subscription delivered straight to your door. Never miss an issue of Picture Arrowwords and subscribe today! Be the first person to tell us what you think about Picture Arrowwords and you'll save £2.50 on your next purchase!